This Tracing Lines Busy Bag is perfect for helping your preschooler learn to write. This busy bag idea is super easy to make. There is only a little bit of work involved and your child will be tracing lines in no time. 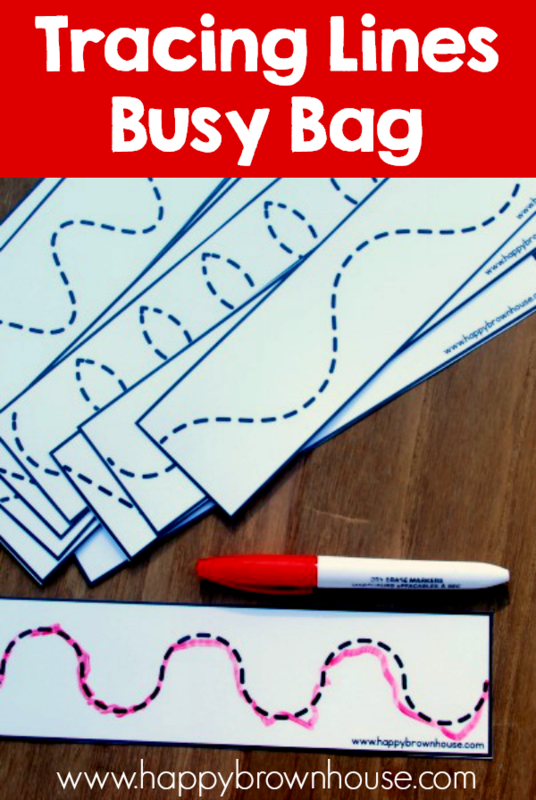 In this easy busy bag idea kids will practice tracing lines with a dry erase marker that is easily wiped off. To make it, you simply print, laminate, and cut. Super easy! 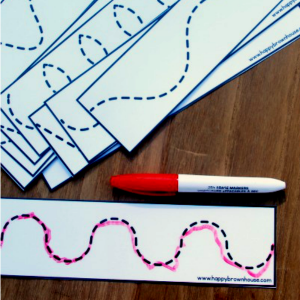 This printable for a tracing lines busy bag is a perfect introduction to writing for preschoolers. 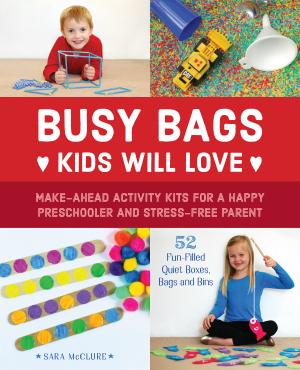 This preschool busy bag idea is a perfect way to put those fine motor skills into practice and let children begin to learn to write. 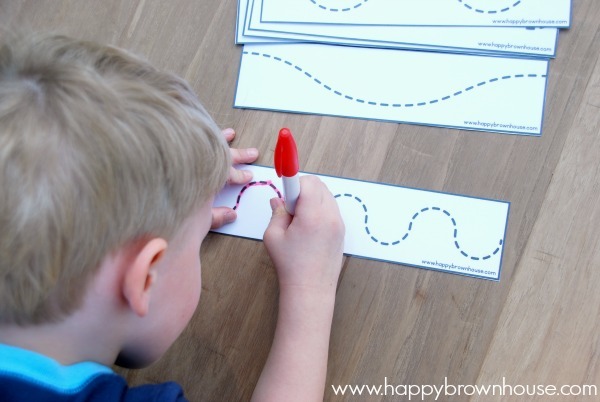 Tracing lines is a natural progression for kids who are learning how to write. The tracing lines in this printable busy bag feature a lot of pre-writing strokes kids need to learn to form letters. For example, the slanted/zig-zag lines are great for kids learning how to write the letters A, K, M, N, V, W, and Z. These pre-writing strokes are an integral part of learning how to write, so let’s make sure to give kids lots of practice. Since this busy bag involves a dry erase marker, the kids can erase and trace as many times as they want. Purchase and download the printable Tracing Lines Busy Bag from my blog shop. Print the printable Tracing Lines pages. 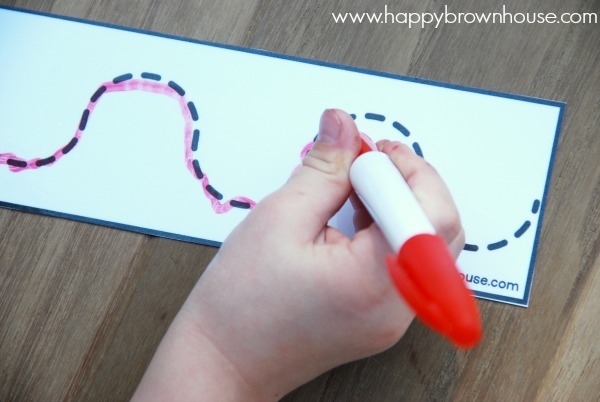 Let your child practice tracing the lines with a dry erase marker. Since it is laminated, it will wipe off easily. Hole punch the tracing lines cards and place them on a book ring to keep them held together. Place a small square of felt in the bag to be used as an eraser. I am a firm believer in working on fine motor skills through play and not just writing and tracing worksheets. I don’t push holding a pencil or writing until they show interest. In this case, I am following my child’s lead and providing him with the next step in learning how to write. This will be added to our busy bag rotation and will not be used daily unless he chooses to. I will continue to provide lots of natural ways to develop fine motor skills and continuing to teach proper pencil grip. I encourage you to do the same until your young child is ready and showing interest. What’s the Big Deal About Fine Motor Skills Anyway? How do you down load the free printable. I can’t find where the button/spot to click on to get the worksheet s I am interested in. Am I missing something? Hi Mericia, If you click on the words at the bottom of the post that says Free Printable: Tracing Lines Busy Bag it will download for you. Hope that helps! HI, these are so great. How do I download them. Thank you. If you click on the words at the bottom of the post that says Free Printable: Tracing Lines Busy Bag it will download for you. Hope that helps! Thanks for these. I know my son will really enjoy doing this. I printed on different colored card stock just to switch things up a little. I’m in the process of adding all the freebies to my blog shop. The Teachers Pay Teachers is only for non-U.S. residents. If you hit “add to cart” it will go through a check-out process (even though it is free). You will be able to make an account with all of your free downloads available in one spot should you ever need to download them again. Sorry for the confusion.